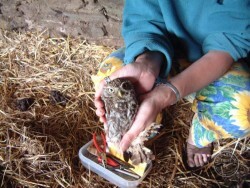 Owl ringing provides important information that underpins conservation work for owls in the same way as for all other birds. 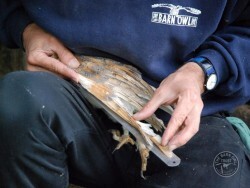 The bird ringing scheme in Britain is run by the British Trust for Ornithology and the vast majority of ringers are volunteers. 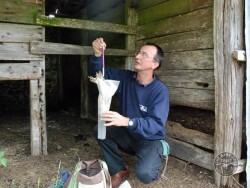 Records of great longevity show that ringing has no impact on the birds’ health or survival. A perfectly fitted ring has no gap. 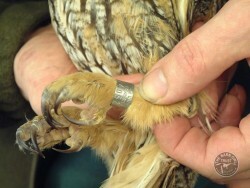 This is an ‘FC’ British Trust for Ornithology ring. 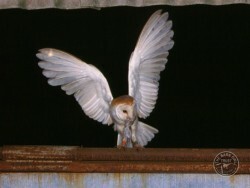 Most Barn Owls are ringed as nestlings at between 3 and 7 weeks old. FC rings are almost always the best fit but they often need to be ‘tweaked’. Age is determined by measuring the length of the folded wing. Bodily condition is mainly determined by weighing. 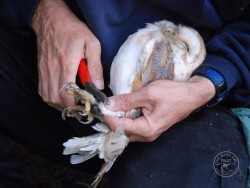 Fully fledged Barn Owls are sometimes ringed as well. 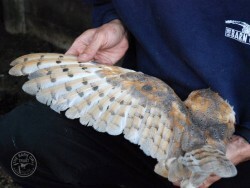 Wing length is usually taken, especially if it’s still growing. This adult is growing a new P8 feather so it is probably in its third year. 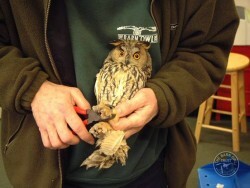 Sometimes we ring Little Owls. These take a smaller ‘E’ ring. Long-eared owls take a ‘G’ ring – the same as Tawny Owls. If you ever find a ringed bird (any species) please make sure you report it. Sometimes we fit plastic coloured rings so we can identify individuals without reading the ring number.